From ugly duckling to beautiful swan, this property is going to be a solid performer in Maya and Jorma’s property portfolio. Less educated might completely overlook this property because they allow appearances to get in the way of financial performance. 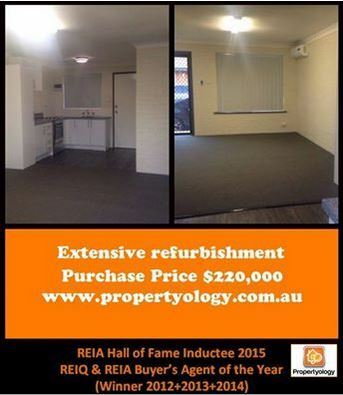 Propertyology could have easily found a ‘nicer’ looking property however the objective of investing is to make money. And, when you only pay $220,000 for a rock-solid property in a future growth area that means lots of upside! Ideally located close to the CBD, shopping precincts, major employment hubs such as the hospital, and within walking distance to the beach, this location has all the fundamentals that astute property investors look for. This particular city is not one that you will see popping up in “expert” media reports of hotspots or must buy suburbs. In fact, there has been very little investor activity in this location for some time, and subsequently there tends to be ample stock on the market for us to consider. This allows the Propertyology team to get creative with our offers to purchase. In this particular case, we worked closely with the selling agent to agree on a scope of works to be completed prior to purchase. We negotiated terms that meant the seller had to complete a refurbishment prior to settlement. Fresh paint, floor coverings, kitchen upgrade, and more completed at the Seller’s expense. So, not only did our client only pay $220,000 but they will have no major capital outlays for several years. They have a low maintenance, neat and tidy, 2-bedroom apartment, in a highly desirable location. PROPERTYOLOGY’s outlook for this location is so positive, we expect that over time, this once ugly duckling will turn into a beautiful swan – from a monetary perspective at least – for the lucky buyers.